Leonid Ilich Brezhnev was born on December 12, 1906, in Kamenskoye (now Dneprodzerzhinsk), an industrial town in the Ukraine. He was one of three children of Ilya Yakovlevich Brezhnev and Natalya Denisovna. His father worked in a steel mill, as had members of several previous generations of the family. Brezhnev's childhood was far from ideal. During his youth a civil war raged in the Ukraine, the Russian Revolution occurred in 1917, and World War I (1914–18) was fought. Brezhnev was forced to leave school at the age of fifteen to go to work. He continued as a part-time student of land surveying at a trade school and graduated at the age of twenty-one. In the years after his graduation, Brezhnev held a number of minor government posts. He also joined the Communist Party, whose members believed in a system in which there was no private property, and goods were owned and shared by all people. Under Soviet leader Joseph Stalin (1879–1953), peasant farmers were ordered to sell their extra grain to the state rather than keeping it for themselves. 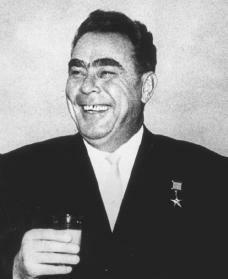 Brezhnev was one of many party members who beat and threatened the peasants to get them to cooperate. Eventually Brezhnev enrolled in the Kamenskoe Metallurgical Institute, graduating in 1935 as an engineer. He left the field of engineering after a short time, however, in favor of returning to government and party work. By the beginning of World War II (1939–45) Brezhnev was an important party leader in his native region. After the outbreak of the war, he served in the branch of the Soviet Red Army responsible for setting up Stalin's "Russification" policy (under which, for example, children were forced to study Russian subjects in school, and newspapers were ordered to be printed in Russian only). He earned many promotions and was given more responsibilities, eventually achieving the rank of major general. When he left the army in 1946, he continued to move steadily ahead as a party official. He gained national prominence in 1950, with his election as first secretary of the Central Committee of the Moldavian S.S.R., one of the republics that made up the Soviet Union. Two years later he left Moldavia for Moscow, Russia, to serve under Stalin in the powerful Secretariat (official organization) of the Central Committee of the Communist Party. The progress of Brezhnev's career was briefly interrupted by Stalin's death in 1953. Brezhnev was removed from the Secretariat and assigned to lesser posts, first in the Ministry of Defense and later in the Central Committee of the Kazakh republic. But because he proved to be such a successful administrator, he was recalled to Moscow in 1956 to serve again in the Secretariat. He worked closely with Nikita Khrushchev (1894–1971), the new head of the Secretariat and the most powerful man in the Soviet Union. In 1960, with the support of Khrushchev, Brezhnev was chosen chairman of the Presidium of the Supreme Soviet. This post brought Brezhnev great prestige but not great power. After three years Brezhnev returned to the Secretariat, where he allied himself with other leaders who were unhappy with Khrushchev's record. In 1964 this group succeeded in removing Khrushchev from power, after which Brezhnev took over the most important of Khrushchev's former positions, that of first secretary of the party's Central Committee. Brezhnev became seen as the leader of the Soviet Union. In 1966 his title was changed from first secretary to general secretary, the title under which Stalin had served. But Brezhnev was not as powerful as either Stalin or Khrushchev had been. Instead, according to the arrangement that had followed Khrushchev's removal, he became the first among equals and shared power with two others, the chairman of the Council of Ministers and the chairman of the Presidium of the Supreme Soviet. During the 1970s Brezhnev led the Soviet Union in a number of military actions, including the invasion of Czechoslovakia (now the Czech Republic) in 1968 and warfare in the People's Republic of China in 1969. In order to remain popular with its Eastern European group of republics, which were the strongest supporters of Communism, the Soviet Union turned to hostile enforcement of its political system. Perhaps the harshest example was the Soviet attack launched on Afghanistan in 1979, which continued after Brezhnev's death. In addition, the Soviet economy (the system of production, distribution, and use of goods and services), which had flourished at first, had stopped growing by the mid-1970s. Although the end of the Brezhnev years saw an increase in tensions between the United States and the Soviet Union, the two world powers still developed respect for each other. During the years President Richard Nixon (1913–1994) was in office (1969–74), the two leaders of the United States and the Soviet Union often visited each other. They improved relations enough to allow the creation of a joint United States-Soviet space program in 1975, a large purchase of American wheat by the Soviets, and other cooperative efforts. As Brezhnev's health declined, so did Soviet power and unity. This was shown by an increasing amount of criticism from people within the country, such as Andrei Sakharov (1921–1989), a scientist who was imprisoned for speaking out in favor of human rights and against nuclear weapons. Although countries such as Poland, which nearly broke free of Soviet control in 1981, were still no match for the power of Soviet armies, their growing unhappiness eventually led to the break up of the Communist Soviet Union in later years. After several years of serious health problems, Brezhnev died in Moscow on November 10, 1982, leaving the Soviet Union without strong leadership until the arrival of Mikhail Gorbachev (1931–) in 1985. Brezhnev, Leonid I. Leonid I. Brezhnev, His Life and Work. New York: Sphinx Press, 1982. Murphy, Paul J. Brezhnev, Soviet Politician. Jefferson, NC: McFarland, 1981. Navazelskis, Ina L. Leonid Brezhnev. New York: Chelsea House, 1988.